Warnings about the dangers of mobile phones use when navigating in busy waterways and during pilotage were first recognised over 12 years ago. The most recent incident involves a collision between a tug and barge unit and a large bulk carrier in US waters. It occurred while the tug master engaged in a mobile phone personal call while also communicating by VHF with the pilot of an approaching bulk carrier. The US National Safety Transport Board singled out the tug master’s use of his mobile as the primary cause. Their finding being that it had distracted the master from his legally prescribed lookout and navigation duties. In terms of the intensity of operator distraction, research has shown that the use of a mobile phone while driving a car (whether in hands free mode or not) is equivalent to driving while being under the influence of alcohol at the legal limit. In the USA and many countries these limits are now set at 0.08% for private drivers and may be as low as 0.04% for commercial drivers. For airline pilots the limit is commonly set at 0.04% and as low as 0.02%. The updated STCW Convention limit for mariners is now 0.05% when on duty and a maximum of 0.08% when off duty. The dangers of the distraction caused by use of mobile phones while driving a road vehicle are well recognised and many countries consider their use by a driver to be a criminal offence. Despite the imposition of heavy fines and jail sentences, drivers continue to flaunt the law with some of them even reading and exchanging text messages. Many innocent people have died or been crippled for life as a consequence and massive liabilities have been incurred. Why are warnings being ignored? Driver aberrant behaviour appears to be due to a gross failure of awareness of the intensity of mobile phone use distraction and the very high level of risk which it presents. In 2005 the UK’s Maritime Coastguard Agency (MCA) recognised from navigation accident trends that similar human element problems existed on board ships. The MCA’s Guidance Note MGN 299 on Unsafe Navigation Caused by Mobile Phone Use recommended that strict limits be placed on the use of mobiles during navigation. Further, that these limits should be set out in the ISM Code procedures for both shipping companies and on board their ships. Should mobile phones be banned from the bridge? Regrettably, the dangerous distraction problem has not been solved and has undoubtedly been worsened by the technical advancement of mobile phones into mini-computers providing multiple communication platforms as well as games and video entertainment. As a consequence, the maritime industry seems to be moving towards a position that not only should the use of mobile phones and similar devices be restricted during navigation, they should be banned entirely from the bridge and other risk critical areas. Banning of course brings its own dangers in that prohibition may actually encourage furtive utilisation. So what should a shipowner and/or ship manager do? Ban mobile phones and other similar devices from the bridge and other critical areas? Or rely on the good judgement of shipboard personnel aided by increased risk awareness and training based on ISM Code and company procedures? To aid the decision process, shipowners and managers need to carefully consider the significant risks and exposures to liabilities they may face. The number of navigational incidents and ‘near misses’ that involve mobile phones and the distraction they cause must by now number in the thousands. Some are reported and have been found by investigating maritime authorities to be directly causative of collision and grounding incidents as well as oil pollution during bunkering and cargo operations. 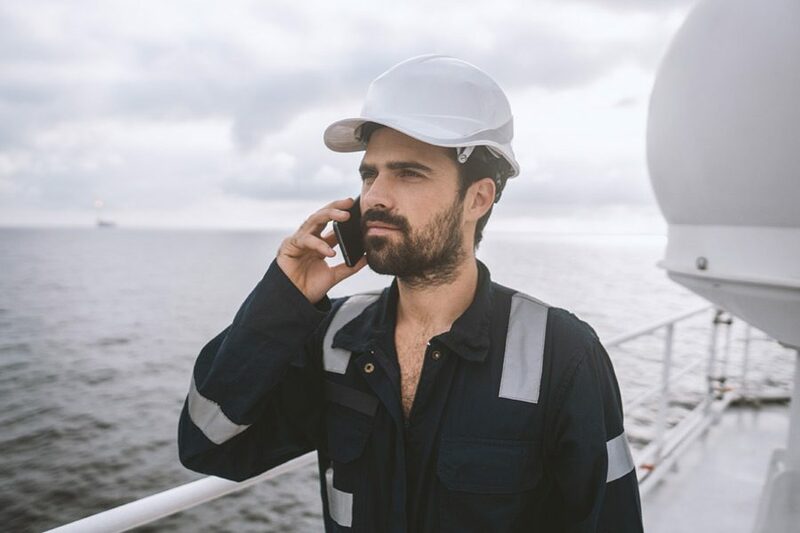 These include the recent collision incident in the US referred to above as well as ships grounding as the master or OOW engaged in calls to agents or personal texting. If such an incident does in fact occur, then the costs in terms of both vessel damage and consequential losses can of course be very high. MM members should bear in mind that the use of mobile phones while navigating could be construed as being in breach of Rule 5 of the COLREGS which specifically requires that the bridge team “…maintain a proper lookout by sight and hearing as well as all means appropriate…”. Under the terms of the Merchant Shipping Acts in many countries (e.g. UK, Singapore, Hong Kong), a breach of Rule 5 could also be construed as being the criminal offence of operating a vessel in an unsafe manner. This can lead to the imposition of fines and imprisonment against both the offending party and the owner. Further, if the breach is found to be causative of a collision, then this would weigh heavily against the shipowner in relation to the ultimate apportionment of blame. Review the content of the MCA’s MGN 299 and its recommendations and ensure that a clear policy is formulated in relation to restrictions on the shipboard use of mobile phones. Ensure that the agreed policy is clearly communicated and properly implemented throughout your fleet, inclusive of its incorporation into ISM Code procedures manuals. Areas of high traffic density. The vicinity of offshore installations and other structures. The approaches to ports, harbours or anchorages. If banning is effected, then this should be implemented by incorporating the banned areas as clearly marked ‘Red Zones’ within the voyage planning process. Support the master’s authority to remove and secure mobile phones from bridge team members who do not comply with banning requirements. If you do not have a clear and well implemented mobile phone use policy in place for your fleet, then a mobile phone related incident is waiting to happen. Please don’t wait for what could be a very nasty result. Clean Bills, Dirty Bills and LOI’s – be very careful! A reminder and a guide to shipowner/carriers on the risks related to a wrongful description of cargo in a Bill of Lading (B/L) as being in “Apparent Good Order and Condition” (i.e. ‘Clean on Board’) when in fact – like the steel coils shown in the above photo – it is not. The ingress of seawater through steel cargo hatch covers and wet damage to cargo presents a high-cost risk for shipowners and their P&I insurers.